If Chandler Burr separated this perfume from its context, I wonder if it would still exist? 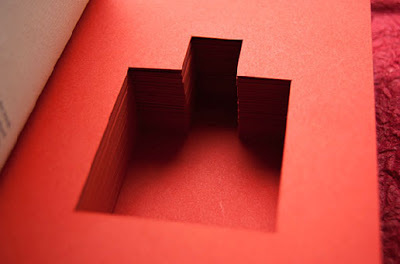 You just can't resist these conceptual things, can you? "Gerhard Steidl was first alerted to the importance of the smell of a book by Karl Lagerfeld." "Paper Passion is accompanied by texts from Karl Lagerfeld, Günter Grass, Geza Schoen and Tony Chambers." That's some bunch. With Günter Grass now packaged along with a designer, a perfumer and the Wallpaper editor, he's practically a bright new face in fashion! 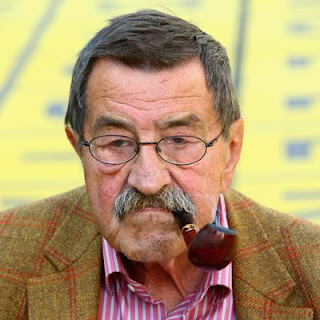 Günter Grass: a candidate for Nerd Boyfriend. I LOVE conceptual stuff. And I love all of the extras, 1) because they could've easily sold the perfume without them for the same price, and 2) you KNOW they're gonna be ridiculous. People complain about the silliness of perfume marketing, but combine that with fashion? With Karl Lagerfeld? Oh my gosh, these accompanying texts will be utterly terrible! You know they will. 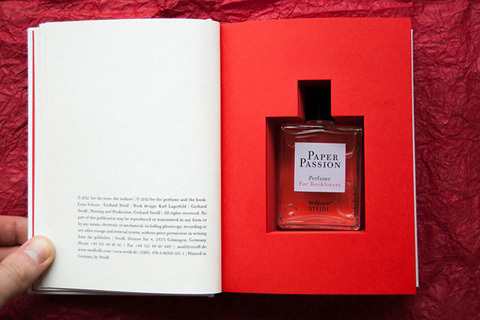 Plus, how can I resist "a perfume for book lovers"? And the audaciousness to include text from Karl Lagerfeld in a project ostensibly for book lovers. It's such a collision of concepts and talent and pretension! 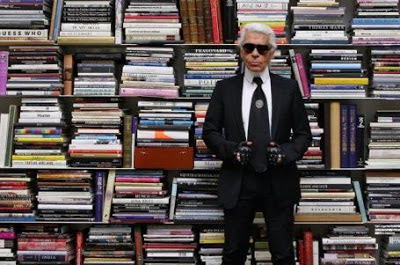 A collision of Karl and books. My Paper Passion just completed its ten-day postal odyssey and landed at my front door. I sprayed it on about an hour ago and it's much more of a kaleidoscope than the flat-as-cardboard In The Library by CB I Hate Perfume. And I'm definitely at the glue/chemical stage (though it's not nearly as severe as Comme des Garçons Eau de Parfum). Unfortunately, I have to go for my run now, which is going to ruin everything. Running on a hot day while trying to gauge a perfume is sometimes like trying to gauge a movie while sitting too close to the screen with the sound up all the way. By the time I return, I fully expect to hate Paper Passion. Then I'll start all over again with it tomorrow. During my first half of the run, I came to some revelations: I think the primary difference between Paper Passion and In The Library is In The Library is, by the perfumer's admission, the smell of old books, and Paper Passion is the smell of new ones, which is inclusive not only of fresh paper stock (definitely glossy), but ink and glue and chemicals, all things that would have long faded from the stimulus for Christopher Brosius's scent. His smells of old paper, full-stop. Now here's where the long runs on hot days get me in trouble: as I went along, the perfume's strength didn't diminish and before long I could swear I was smelling that insidious chemically sweet woodsiness of Molecule 01. Which makes me think about Iso E Super, which makes me stop thinking about paper altogether. I love Paper Passion as a piece of art and I love books and love to read so who could resist that. As a fragrance I am not sure it has the kind of longevity that would make me want to wear it as my fragrance of the day but I do love opening the book and taking out the bottle and imagining what it could be like to wear a book. My other favorite paper fragrance is Dzing. So I wonder how many other fumies have a book with a bottle in it now. xo from Mirabelle and I.
onesmalldog, I like how Paper Passion is providing a satisfying experience just picking it up out of the book box. Maybe just start putting surprises in all of your own books, cutting a cookie or flask-shaped hole in which to secrete your treats. I like that idea.. Miss Mirabelle votes BONE SHAPE. Hope all is well with you Ms. Katie...love when your postings arrive. Hope you have some holiday Cheer your way and Happy Christmas to you. I think it is a fun idea. Kind of like..."The Nazi's are storing into Paris...where can we hide the Perfume?" Or the IFRA storming into Paris: "Quick, hide the oakmoss in the book!" Oh I just noticed Dan that I wrote "The Nazi's are STORING into Paris." Most likely heading to Chanel for a little storing. Oh darn....me and my anxious spelling. I'm glad to see that there are perfumers still thinking outside of the box. Good post. Are Eight & Bob and Paper Passion packaging twins separated at birth?